The Met Office has issued more weather warnings as parts of the UK continues to batten down the hatches for further spells of heavy and persistent rainthat will affect southern parts of England and south and central Wales from Thursday afternoon until Friday morning, as large parts of Britain remain at risk of further flooding. Severe weather warnings - meaning a danger to life - continue to remain in place from Cornwall to Dorset, and the Somerset Levels as waves and strong winds continue to batter the coastal regions, while more rain is expect from late Friday evening until early Saturday followed by frequent heavy showers. Gales will accompany the rain during Saturday with severe gales - with gusts of up to 60mph - likely for exposed coasts in southwest England, while another separate area of low pressure from the Atlantic is expected to continue to bring further rain and strong winds on Sunday. Andy Page, Met Office Chief Meteorologist, said: "The unsettled weather will continue over the coming days with heavy rain across the southern half of Britain on Thursday evening into Friday, and that will be quickly followed by another storm moving in early on Saturday. "This will bring the risk of flooding and damaging winds bringing down trees to cause disruption to travel and power networks." 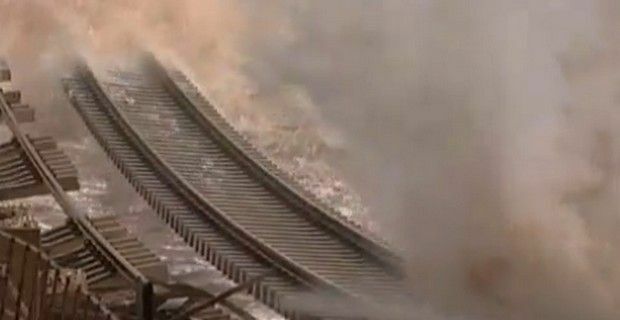 Yesterday in Dawlish, between Exeter and Cornwall, about 100 feet of seawall under the coastal railway line collapsed, cutting off rail services from the rest of the county. Several residents also had to be evacuated from their homes in the seaside town, while two people had to be rescued from a car, with a spokesperson warning people to stay away and avoid coastal areas. PM David Cameron chaired a meeting of the emergency committee Cobra to discuss a response to the flooding, announcing an extra £100 million to help with the clear-up operations, with £75 million destined for repairs, while another £15 million will be for maintenance and £10 million for “urgent work” in Somerset.